An early working copy of the Star Trek Ship Guide. The Ship Guide will eventual contain all of the text description information on each ship, much like the Babylon 5 Wars Ships of the Fleet books did. The Star Trek Ship Guide will also come to house any special rules, notes, or insights as to the races of the Star Trek universe, including their individual background and technical histories. A compilation of the 87 Klingon ships, fighters, shuttles, and bases available at Planetside. Includes three versions of the NX Experimental Cruiser and the NX Shuttlepods. Includes the first three Pakled ship control sheets. A compilation of the 67 Romulan ships, fighters, shuttles, and bases available at Planetside. Ships for the Son'a Empire. Updated August 15, 2003. A collection of all of the Tholian ships as of January 19, 2004 in a download-friendly zip file. A compilation of the 125 Federation ships, fighters, shuttles, and bases available on the Planetside website. Included in this ship control sheet archive are many early Vulcan ships as seen on "Enterprise". This includes the D'kyr, Sh'ran, Surak, Ti'mur, Vahklas, and D'Vahl warships. Last updated September 13, 2003. A collection of all of the Xindi SCS, as of October 12, 2004. Counters for Andorian and Vulcan starships. Counters for the Bajoran Militia, Civilian, and Children of Tama. Counters for the Borg and Species 8472. Note that these counters are done using gradients just like the AOG ancients, so the file size of the PDF is much larger than that of the other counters. Counters for the Breen and Son'a. Counters for the primary units of the Cardassian Union. Countersheet for secondary units of the Cardassian Union, including bases, OSAT's, and shuttles. Updated August 24, 2003. Counters for all current Dominion units, including both Jem'Hadar and Karemma vessels. Federation counters for primarily The Original Series and Movie Era units. Federation counters of The Next Generation and transitionary units. Federation counters for ships from the FASA Star Trek Starship Tactical Combat Simulator. Federation shuttlecraft, including the Danube Runabouts and Peregrine Fighters. Federation counters for a number of new Federation units from the shows as well as other licenses. Counters for Ferengi units, including those units from the Birth of the Federation computer game. Counters for the Gorn, including ships from both the FASA Star Trek Starship Combat Simulator as well as Star Fleet Battles. Klingon counters, including most of the units from the show. Klingon counters for ships from the FASA Star Trek Starship Tactical Combat Simulator and ADB Star Fleet Battles game systems. Klingon counters, including additional counters for other units found on other countersheets and Klingon shuttles. Counters for several new Klingon units released or developed since the last countersheet release. Counters for the following races or factions: Krenim, Malon, Maquis, Miradorn, Pakled, Hunter, Talarian, Yridian, and Civilian. Counters for the following races or factions: Space Monsters, Federation Timeships, Suliban, Orion, and Nausicaan. Counters for the primary Romulan units. Counters for other Romulan units, including many from the FASA Star Trek Starship Tactical Combat Simulator. Counters for recent and future Romulan units, including Romulan/Reman units from Star Trek: Nemesis. 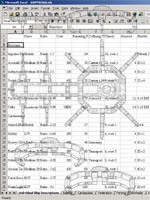 Daniel Sallee has created an excellent Excel 2000 spreadsheet comparing the fleet structures of the major Star Trek races based on the ships in the conversion. Included with the spreadsheet is a commentary that describes the spreadsheet elements and walks the reader through the logic behind the spreadsheet.